Be sure to make use of the barbeque before the cool weather returns. TEMPERATURES ARE SET to reach up to 19 degrees over the next couple of days, and make sure to get out and enjoy the sun because it looks like we’ll be returning to mild weather by early next week. Met Éireann says there will be little to no rainfall today across the country, with highest temperatures of 19 degrees. The weather will remain dry and calm tonight, but temperatures will drop to as low as 3 degrees with a touch of grass frost. The sunshine is sticking around tomorrow, for the most part, however, the northwest will see cloudier conditions and some light rain. Temperatures will again range between 13 to 18 degrees, with the warmest conditions in the east. 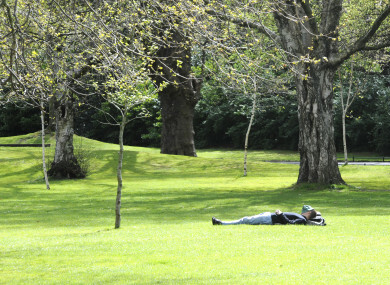 Unfortunately, the warm weather will ease off as we enter the weekend, according to Met Éireann. While temperatures on Saturday are expected to reach up to 19 degrees, Met Éireann says it will be cooler along the east coast where temperatures will closer reflect the temperature of the sea, coming in at about 9 or 10 degrees. It is expected to become cloudier throughout the day on Saturday, as some showery bursts of rain are forecast to gradually move up from the southeast and become more widespread in the afternoon and evening. On Sunday, conditions will be milder again as cool Atlantic westerly air comes in across the country. Sunny spells and blustery showers are forecast for the day. Looking forward to next week, Met Éireann says it will be mild again with fresh westerly breezes with sunny spells and scattered showers. Email “Temperatures to hit 19 degrees this weekend ... but milder weather is to return early next week”. Feedback on “Temperatures to hit 19 degrees this weekend ... but milder weather is to return early next week”.